You are here: Home / CIS Football / Jim Mullin: Eye on the CIS: Nill, Constantin benefit from providing options to players. Jim Mullin: Eye on the CIS: Nill, Constantin benefit from providing options to players. Barring a last second shift, BC is not in the plans for Kirby Fabien but Plan B and Plan C is. The planned return of Fabien, the seventh overall pick by the Lions, to the Canada West is not going down well in Lions headquarters. Only a surprise contract counter offer Hamilton’s 13th overall pick OL Carson Rockhill could derail destined to return to the foothills city to start and to finish his degree. Drew Edwards in the Hamilton Spectator reported late last week that linebacker Frederic Plesius was returning to the Laval Rouge et Or. Richard Boutin of Le Journal de Quebec reported that two-time Metras Award winner DE Arnaud Gascon-Nadon will follow his teammate’s lead, staying in Quebec City rather than signing in Hamilton. University of Calgary head coach Blake Nill and Laval Rouge et Or head coach Glen Constantin are good friends. So much in fact they are in contact with each other on a regular basis. When you read the various reports on these players who have declared their return to the CIS, the one thing they share in common is their desire to obtain their degree while playing football. Is it possible that Constantin and Nill consulted each other on talking points so they could retain their best talent? One has to ask that question when you see the results of four key players who could seriously change expectations for those teams in the Canada West and the RSEQ. Both coaches are central in these player’s lives and have their ears. Offensive lineman and former Dino Mark DeWit played two seasons in Toronto and two in Hamilton and managed to take classes in the winter semester to finish his degree while playing. I’d hazard a guess that Nill wasn’t using that example when in dialogue with Fabien or Rockhill, or for that matter last year when running back Matt Walter stated before the draft that he was returning for his fifth year. That being said a fourth or fifth year player isn`t a kid and should be able to employ their own critical thinking. What is also at play is the question of development. Many predicted the elimination of the NFL option window would hurt CFL recruitment in the United States. Not surprisingly, the CIS side of the equation was taken for granted. In the case Plesius, the 24 year-old hopes he can get another shot at an NFL camp and the one-plus-one option year contract would stand in the way of another NFL look. Plesius took correspondence courses this winter to get the 18 credits needed to qualify academically for the RSEQ if he could not catch on in the NFL. There’s that secondary plan again, which is not good news in so far as the CFL is concerned. With expanded NFL rosters the dream remains alive for raw CIS talent to develop stateside. Something similar could be said of Fabien who at 21, may have been reminded of the path Dan Federkeil took from the U of C to a four-year NFL career with the Indianapolis Colts which included a Super Bowl ring. Fabien’s agent is Washington, D.C’s Johnathon Hardaway who represents Concordia grad and Kansas City Chief Cory Greenwood along with Matt O’Donnell of Queen’s who signed a two-year deal with the Cincinnati Bengals. Rockhill still has two years of eligibility left, so the extra eight to possibly 12 starts won’t hurt his development. 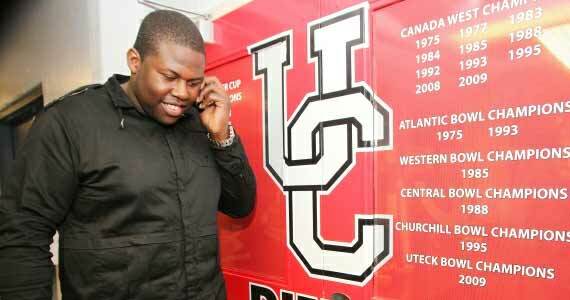 If the scholarship doors are ever forced open in the CIS for a limited number of full-rides, Canadian university players will have another card to play in contract negotiations with CFL teams. While it is not a crisis, perhaps the time has come where the CIS and CFL should seriously look at working on a more integrated player development system.